An unusual event occurred in Alaska within the 1949-1951 time period. A couple, naked and covered in dirt or dust, came to the door of Victoria Jahnke’s mother. They asked if they could bathe. Her mom reluctantly agreed to this. Before they left she gave them clothes. When she cleaned out the bathtub her hands went numb. Nothing she did would help. Suddenly there was a knock on the door. She found a very tall man standing there who had a tube of salve in his hand. He tore it in half and gave one half to her, telling her that it would take care of the problem with her hands. It did. She saved the remainder of the salve for years, wrapped in a handkerchief. It dried to a pink powder. Victoria gave some of the sample to Bill Jones at the Dearborn MUFON symposium in July 2003. Bill submitted the sample to me for analysis. The salve contains calcium bentonite (60 wt.%), glycerol (glycerine) (30 wt.%), and a mix of long chain mono-, di- and tri- glycerides (10 wt.%). A small amount of free carboxylic acid and carboxylic acid salt is also present (less than 5 wt.%). The above reported quantitative amounts are very rough estimations, and certainly not representative of the original salve composition, though it is very probable that calcium bentonite predominated. More glycerides, which are natural oils, were most likely present. It is suspected the glyceride esters originally were in higher amounts to give the salve a grease-like consistency. The glycerides appear to have suffered some deterioration and probably experienced absorption into the handkerchief during the half century since the event. Hence, the salve is now solid. The presence of a long chain carboxylic acid is suspected to be degradation product resulting from decomposition of the glycerides, thereby supporting the degradation speculation. The carboxylic acid in salt form may be part of the original composition of the salve and associated with lead, i.e. a lead carboxylic acid salt. Perhaps water was initially present. If so, it would have long ago evaporated. The use of calcium bentonite in salve is widely touted as a cure for a wide variety of ailments, including many skin irritations especially by holistic medicine. The composition is similar to a commercially available salve, Pasca-Balm Bentonite Ointment & Skin Softener 1. The advertisement can be found in the appendix. Some history of calcium bentonite is also provided on the website. It was known by Native Americans as a healer, before the coming of Europeans. The tube container is composed of tin. 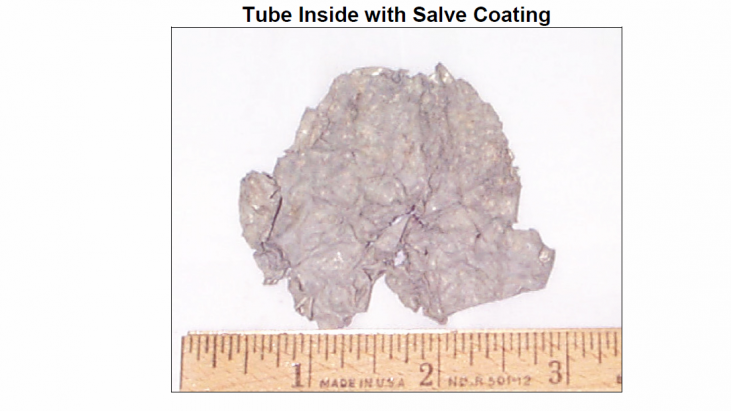 Metal Oxide was detected in the dried salve, but it is highly probable that it is oxidized metal from the tube.